In stock. Order in the next 19 hours, 39 minutes and it will go out today! • Take control and breathe easy an Open Peek, Simple Cull, Top Down Stack, Bottom Up Stacking, Intermediate Riffle Stacking and Culling, Vegas Peek, Plan Culling, advanced stacking, Faro Stacking, Misdirection Peeks, Culling While Stacking, Compensating Faros, Working the Top and Bottom, The Double Duke, and Impossible Stack! • From the very basics of Overhand Stacking, Ordering, using an undercut, dividing the Stack, Collective Culling, Foundation Stacking, Square Up control, Corrective Cuts, and Trigger Cards, Slowly advancing to advanced Overhand Peeking & Culling, the Bottom Peek, Shift Peek, Shuffle Peek, Marked Cards, Riffle Stack and Cull, Casino Shuffle, Scarne Shuffle, Fools Shuffle, and the use of Stealing, Palming, and Shifts in Stacking! • Never before seen exclusives! 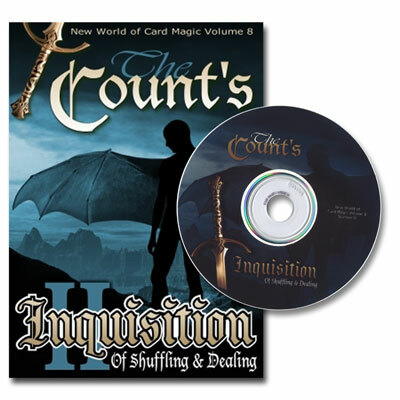 Demonstrations of the Count's Riffle Stacking System, culling a random four of a kind in only two shuffles, culling two random four of a kind with only three shuffles, culling and stacking four aces and four kings in only three shuffles, PLUS applications of the Count's Riffle Stacking System!